As co-director of the London Yoga Teacher Training Course (LYTTC) I am part of a team training yoga teachers in an approach to yoga influenced by the work of Vanda Scaravelli and Mary Stewart. 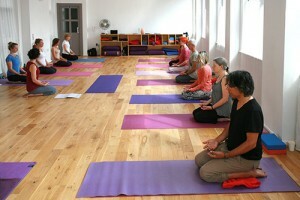 This two year course, founded by Chloe Fremantle, falls under the London Yoga Teacher Training Group (LYTTG) umbrella. The course provides the practical skills and expertise needed to teach yoga safely and with confidence. The extensive syllabus covers philosophy, anatomy and physiology in order to deepen understanding of yoga and develop personal practice. The LYTTC is an accredited BWY teacher training course. The LYTTC 2015-17 commenced in October 2015 and is fully subscribed. Course directors on the 2015 – 2017 training are Cara Bowen, Lisa McRory and Anne-Marie Zulkahari. Core faculty includes Peter Blackaby, Lesley Dike and Neville Cregan. For information about the 2018 – 20 training, due to commence April 2018, go to lyttg.co.uk or contact the LYTTC administrator.